Sandy is always whipping up something good to serve at Adrian’s! You’ll have to give this recipe a try…it features Desert Gardens Chipotle Chile Dip Mix (available at Adrian’s). Mix all ingredients together and let chill for an hour or two to let flavors blend. 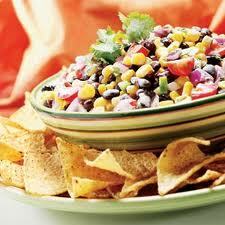 Serve as a salad or with tortilla chips. YUM! You may order the Desert Gardens Dip Mix from Adrians. Enjoy!